Part 1 of a behind-the-scenes look opXpeditions: Colombia, an OutpostTV show. Watch it here. When conjuring up images of Colombia, many of us wouldn’t automatically think of big cities. But unlike most of its Latin American neighbours, Colombia’s population is actually largely urban, with only 25 percent of its 48 million citizens calling the countryside home. Another interesting fact: just as Canadian cities have their rivalries, so too do Colombia’s metropolises. In fact, the two biggest cities, Bogotá and Medellín, have a sibling rivalry of titanic proportions. The funny thing is that Rolos (people from Bogotá) actually think Medellín is pretty cool. The Paisas, inhabitants of Medellín, on the other hand, don’t always return the love (sound familiar, Toronto and Montreal?). But we’re not here to take sides, so let’s get down to what some of Colombia’s biggest urban centres have to offer. If you are flying to Colombia, there’s a good chance Bogotá will be your gateway into the country. On the surface, Bogotá appears to be another sprawling city tucked between the folds of several mountains. 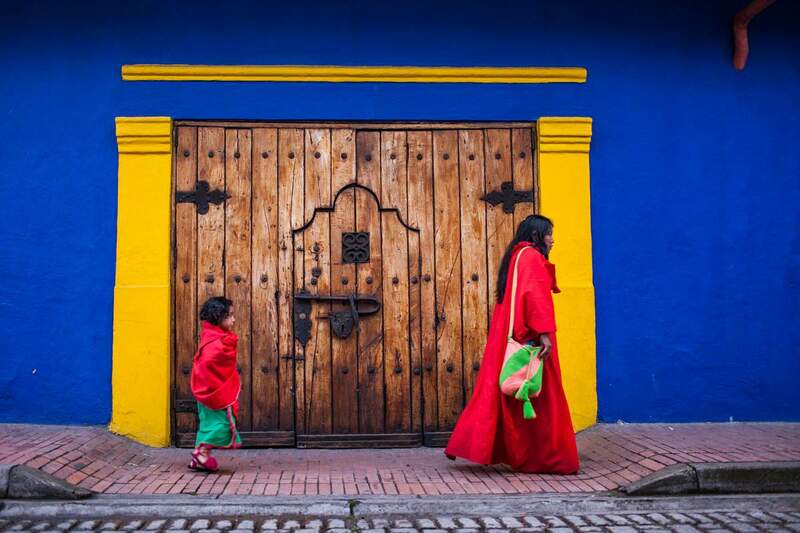 Spend some time walking its streets and your impression of Bogotá will likely change. This is a city on the move, and a great deal of the country’s business is done here. But it’s not all suits and ties, either. Arguably, the most famous neighbourhood in Bogotá is colonial Candelaria, its historic old town. Here, we could see and feel history at every turn—whether dining in 19th-century surroundings, or being schooled in more recent political events at the Justice Palace. At night, university students gather near the campus, the plaza hopping with music and celebratory drink. Other highlights include the gold museum, El Museo del Oro, which houses thousands of priceless gold artifacts created by the multitude of indigenous tribes that inhabited the region prior to the arrival of the Spanish. Internationally acclaimed artist Fernando Botero—oh, he of the well-rounded, voluminously rotund figures—may have been born in Medellín, but his namesake museum sits comfortably in La Candelaria. Finally, to get the big picture, a trip by tram to the hilltop of Monserrate is the way to go (or, if you’re feeling fit, you can hike up). Monserrate not only offers great views of the valley below, but it’s also a pilgrimage site for those visiting the church and the statue of Senor Caído, the Fallen Christ. Even though Medellín was established way back in the 17th century, it certainly isn’t a city stuck in the past. In recent years, it has been making waves and plenty of Top 10 lists as a travel destination. So what’s the deal? In a word, urban planning. In 2012, Medellín was voted “Most Innovative City of the Year” in a prestigious international competition. Also in Medellín’s favour is its moderate climate. Sitting at 1,500 metres above sea level, the weather is consistently gorgeous—hence its nickname “The City of Eternal Spring.” There are plenty of galleries, theatres, green spaces and cafes to keep Paisas and visitors alike stoked to be there. At approximately 500,000 inhabitants, the northern city of Santa Marta certainly isn’t the biggest kid on the block—but it possesses many great attributes, including a gorgeous Caribbean coastline, some funky neighbourhoods, and an incredible history. Founded in 1525 by the Spanish conquistador Rodrigo de Bastidas, Santa Marta is, in fact, the first Spanish settlement in Colombia. We wandered in the city’s cobbled streets in the warm evening air and in the warm evening air and ate along one o f its bustling pedestrian boulevards and were instantly charmed by the local laidback vibe.